The Brother HL5350DN is a monochrome laser printer that can be used for printing and is quite affordable but can only be used for printing as it lacks copy, fax and scan functionality. Replacing Brother HL5350DN toner cartridges is very easy and quick. 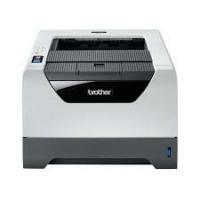 This printer is faster, lighter and provides compact printing at the speed of 30 pages per minute. It weighs 9.5 kg and measures 371 x 384 x 246 mm. The printer does not have an LCD display or a keyboard. It possesses a software control panel that can be tapped into from a PC, Mac or Linux machine so as to access advanced features. Brother HL5350DN is one of the best cost-per-page options for use at home or small businesses that have only light printing needs. It has a USB port and an inbuilt RAM of 32 MB. This printer has a duty cycle of 12,000 pages. It has an input tray of 250 pages at the bottom and a second tray of identical capacity is available as an option. The Brother HL5350DN is a monochrome laser printer which is best suited for use at home or small businesses that have only light printing needs. It gives good quality prints at extremely fast rates but lacks copy, fax and scan functionality. Brother HL5350DN toner cartridges can be replaced easily and are inexpensive. Q. I have been getting poor quality printouts from my Brother HL5350DN printer since yesterday. Is the problem with my machine or with Brother HL5350DN toner cartridges which are new as I’d installed them recently? What should I do? Kindly help. A. Please perform a head cleaning procedure first to determine if your toner cartridges have developed blocked nozzles due to which printing gets hampered. It should solve the problem but if it does not, you could get your printer checked and replace the cartridge if your printer is alright. Q. I received wrong toner cartridges in place of Brother HL5350DN toner cartridges that I wanted. What should I do to get them exchanged? A. Please let the cartridges be unopened and send them for return within seven days through courier or post on the address mentioned on the invoice. Q. I can see some peculiar dots on the pages I’ve been printing with Brother HL5350DN toner cartridges. Can you please advise what’s wrong and how to resolve the issue? A. You need to clean the drum unit in your printer. Please do that by first removing the laser toner from the drum unit and then gently wipe the drum with soft cloth or cotton and then install it again, after which you may take a printout to check the outcome. Q. Is it necessary to use only print media that has been specified for printers or is it okay to use other genres sometimes? A. Please print only on paper that has been specifically stated is to be used in your printer. Using other paper types can cause paper jam or affect the quality of output adversely. Q. Can I install compatible Brother HL5350DN toner cartridges in SCX-4500 laser printer or only original cartridges will work with it? A. You can use compatible toner cartridges also besides original ones with your printer and expect the same high quality results. Q. I immediately need to replace the cartridges for my printer, as my old ones are dried out. How can I get my order faster? A. Our standard service is quite fast. In Most cases, we ship your order within 1-2 business days after you approve your proof online and provide us with all the details. In most of the cases, you will get the delivery just next day as most of our orders that we get by 12 noon are despatched on the same day. If you want to receive your order faster than you can check your order status by going to orders page. Q. How can I refill the toner cartridges for my Brother HL5350DN printer? Do you offer any refill services? A. We do not offer any refill services for the printers. However, you can place the order for the compatible Brother HL5350DN toner cartridges from this website that will cost you same as for the refilled kits. Q. How can I order for the multiple cartridges in bulk for my Brother HL5350DN printer? A. To order for the Brother HL5350DN toner cartridges in bulk please contact the customer care number +44(0)28 308 33221 and we will clarify your query. Q. How to improve the print quality of the printer if the gray background appears on the printout? Put in a new drum unit. Refer the user guide for replacing the drum unit. Q. Does the printer support fax printing? A. The printer gives good quality printouts at extremely fast speed but lacks in copy, fax, and scan functionality.